Cornus canadensis (Canadian dwarf cornel, Canadian bunchberry, quatre-temps, crackerberry, creeping dogwood) is a species of flowering plant in the Cornaceae (dogwood) family, native to eastern Asia (Japan, Korea, northeastern China (Jilin Province) and the Russian Far East), the northern United States, Colorado, New Mexico, Canada and Greenland. Unlike its relatives, which are for the most part substantial trees and shrubs, C. canadensis is a creeping, rhizomatous perennial growing to about 20 cm (8 in) tall. Cornus canadensis is a slow-growing herbaceous shrub growing 10–20 cm tall, generally forming a carpet-like mat. The above-ground shoots rise from slender creeping rhizomes that are placed 2.5–7.5 cm deep in the soil, and form clonal colonies under trees. The vertically produced above-ground stems are slender and unbranched. The leaves are oppositely arranged on the stem, but are clustered with six leaves that often seem to be in a whorl because the internodes are compressed. The leafy green leaves are produced near the terminal node and consist of two types: 2 larger and 4 smaller leaves. The smaller leaves develop from the axillary buds of the larger leaves. The shiny dark green leaves have 2 to 3 mm long petioles and leaf blades that are obovate. The blades have entire margins and are 3.5 to 4.8 cm long and 1.5 to 2.5 cm wide, with 2 or 3 veins and cuneate shaped bases and abruptly acuminate apexes. In the fall, the leaves have red tinted veins and turn completely red. In late spring to midsummer, white flowers are produced that are 2 mm (3⁄32 inch) in diameter with reflexed petals that are ovate-lanceolate in shape and 1–2 mm (1⁄32–3⁄32 inch) long. Inflorescences are made up of compound terminal cymes, with large showy white bracts that resemble petals. The bracts are green when immature. The bracts are broadly ovate and 0.8 to 1.2 cm (5⁄16 to 1⁄2 inch) long and 0.5 to 1.1 cm (3⁄16 to 7⁄16 inch) wide, with 7 parallel running veins. The lower nodes on the stem have greatly reduced rudimentary leaves. The calyx tube is obovate in shape and 1 mm long, covered with densely pubescent hairs along with grayish white appressed trichomes. Stamens are very short, being 1 mm long. The anthers are yellowish white in color, narrowly ovoid in shape. The styles are 1 mm long and glabrous. Plants are for the most part self-sterile and dependent on pollinators for sexual reproduction. Pollinators include bumblebees, solitary bees, beeflies, and syrphid flies. The fruits look like berries but are drupes. Each flower has highly elastic petals that flip backward, releasing springy filaments that are cocked underneath the petals. The filaments snap upward flinging pollen out of containers hinged to the filaments. The stamen accelerate at a rate of 24,000 meters a second. This motion takes place in less than half a millisecond and the pollen experiences two to three thousand times the force of gravity. The Bunchberry has one of the fastest plant actions found so far requiring a camera capable of shooting 10,000 frames per second to catch the action. The drupes are green, globose in shape, turning bright red at maturity in late summer; each fruit is 5 mm in diameter and contains typically one or two ellipsoid-ovoid shaped stones. The fruits are edible with a mild flavour somewhat like apples. The large seeds within are somewhat hard and crunchy. While distinctive as a species itself, the generic placement of these plants has differed in various botanical treatments. When the genus Cornus is taken broadly, as done here, this species is Cornus canadensis, and is included in the subgenus Arctocrania. However, if Cornus is treated in a narrower sense, excluding this species, it can instead be classified as Chamaepericlymenum canadense or as Cornella canadensis. 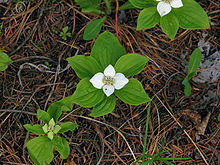 Where bunchberry, a forest species, and Cornus suecica, a bog species, grow near each other in their overlapping ranges in Alaska, Labrador, and Greenland, they can hybridize by cross-pollination, producing plants with intermediate characteristics. Cornus canadensis is a mesophytic species that needs cool, moist soils. It inhabits montane and boreal coniferous forests, where it is found growing along the margins of moist woods, on old tree stumps, in mossy areas, and among other open and moist habitats. Birds are the main dispersal agents of the seeds, feeding on the fruit during their fall migration. 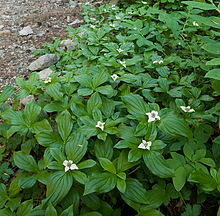 In Alaska, bunchberry is an important forage plant for mule deer, black-tailed deer and moose, which eat it throughout the growing season. Claire Waight Keller included the plant to represent Canada in Meghan Markle's wedding veil, which included the distinctive flora of each Commonwealth country. ^ "Cornus Canadensis". NatureServe Explorer. NatureServe. Retrieved 2018-04-01. ^ Murrell, Zack E.; Poindexter, Derick B. (2016). "Cornus canadensis". In Flora of North America Editorial Committee (ed.). Flora of North America North of Mexico (FNA). 12. New York and Oxford – via eFloras.org, Missouri Botanical Garden, St. Louis, MO & Harvard University Herbaria, Cambridge, MA. ^ Barrett, Spencer C.; Helenurm, Kaius. 1987. The reproductive biology of boreal forest herbs. I. Breeding systems and pollination. Canadian Journal of Botany. 65: 2036-2046. ^ 1949-, Walker, Marilyn, (2008). Wild plants of Eastern Canada : identifying, harvesting and using : includes recipes & medicinal uses. Halifax, N.S. : Nimbus Pub. ISBN 9781551096155. OCLC 190965401. ^ Edwards J, Whitaker D, Klionsky S, Laskowski MJ (2005). "Botany: a record-breaking pollen catapult". Nature. 435 (7039): 164. doi:10.1038/435164a. PMID 15889081. ^ Murrell, Zack E.; Poindexter, Derick B. (2016). "Cornus subg. Arctocrania". In Flora of North America Editorial Committee (ed.). Flora of North America North of Mexico (FNA). 12. New York and Oxford – via eFloras.org, Missouri Botanical Garden, St. Louis, MO & Harvard University Herbaria, Cambridge, MA. ^ Eyde, R. H. 1987. The case for keeping Cornus in the broad Linnaean sense. Systematic Botany. 12(4): 505-518. ^ Eyde, Richard H. 1988. Comprehending Cornus: puzzles and progress in the systematics of the dogwoods. Botanical Review. 54(3): 233-351. ^ Neiland, Bonita J. 1971. The forest-bog complex of southeast Alaska. Vegetatio. 22: 1-64. ^ Murrell, Zack E. 1994. Dwarf dogwoods: Intermediacy and the morphological landscape. Systematic Botany 19: 539-556. ^ Hanley, Thomas A.; Cates, Rex G.; Van Horne, Beatrice; McKendrick, Jay D. 1987. Forest stand-age related differences in apparent nutritional quality of forage for deer in southeastern Alaska. In: Provenza, Frederick D.; Flinders, Jerran T.; McArthur, E. Durant, compilers. Proceedings--symposium on plant-herbivore interactions; 1985 August 7–9; Snowbird, UT. Gen. Tech. Rep. INT-222. Ogden, UT: U.S. Department of Agriculture, Forest Service, Intermountain Research Station: 9-17. Wikimedia Commons has media related to Cornus canadensis. Exploding Dogwood Flowers Williams College website describing the work of Joan Edwards and Dwight Whittaker, with videos and animations. Cornus canadensis holotype from Louis-Marie Herbarium (Laval University). This page was last edited on 10 January 2019, at 21:05 (UTC).